The Epiphany Day is celebrated on January 19 in Russia. It is the day when Jesus was baptized by John the Baptist in the River Jordan. Russian Celebrating it by having an epiphany bath. It’s a bathing ritual in which believers cleanse past sins by dipping into the water at Epiphany Day. It’s a celebration and ritual that’s performed by Russian people every year. Epiphany in Russia is an interesting celebration. Here is a list of 12 Facts of Orthodox festival of Epiphany in Russia. The orthodox church is the second biggest church in the world. Its followers are mostly people in eastern European countries, Russia and post-soviet countries. In Russia, 80 millions of people affiliate themselves to this Branch of Christianity. It’s almost half of the population of Russia! Russia celebrates Epiphany on a different date than the rest of the world. While countries such as Spain or Italy celebrated Epiphany on January 6th, Russian people celebrate it on January 19th. What’s the reason behind this choice of date? In the past, people use Julian calendar, which has thirteen days difference with today’s calendar, Georgian Calendar. Russian people decide to stick with the old dating method, hence why Epiphany is celebrated on January 19. The ritual of blessing the water is very old. Records show that it started since the day of the Tsars. The ritual is different from what it is today, but the basic is pretty much similar. There was a blessing ritual by a priest. There was the holy water which later was sprinkled to objects you want to give a blessing. The main difference is the exclusivity and the dipping part. Back then it was held in the Tsar’s palace and churches around the country. Nowadays, everyone celebrating it, even if they’re not religious. And people bathe and plunge into the water while in the past people rarely did it. Dipping in the water was only famous since the 90s after the soviet union collapsed. 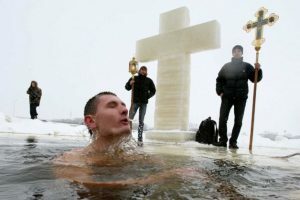 The part of epiphany ritual that separates Russia from the rest of the world the epiphany bath. People cut holes on frozen lakes and rivers with a chainsaw. Usually, a priest then blesses the water hole. Russian people then take a turn to plunge into the blessed water. Epiphany Day falls on wintertime. It’s one of the winter festivals in Russia. Most lake and river are frozen. Water temperature can drop below 0-degree Celsius. In some part, the temperature can be a whopping -30C! But does this discourage Russian people to take a plunge? Apparently not. In 2016 alone, 300,000 people took part in this epiphany tradition. In all other parts in Russia, millions of people follow. Check out other crazy things Russians do in winter. Is it a miracle? or is it because Russian people are simply strong? Even though many people have tried to test their limit in freezing water, no one has gotten sick from it. But that doesn’t mean you can participate without any precaution. Always prepare your body beforehand before start plunging. Nowadays dipping on the day of Epiphany is a social media trend. No one wants to miss the opportunity of looking brave and cool by plunging into frozen water. On epiphany days, expect many hashtags related to plunging, bathing, and dipping. It’s like a challenge in Russia, and everyone eager to participate! Epiphany is originally an Orthodox celebration. But over time, it has transformed into a Russian folk holiday. Regardless of your religious belief, and also regardless of your motives, everyone can participate. Some people do it to cleanse their soul, washing away last year’s sin. Some others just want to have fun and test their strength. As a tourist, you are more than welcome to participate. But always know your limit before you decide to do it. From lakes to sea, to tap water, every water in the world are blessed on the day of epiphany. It’s only once a year, so Russian people make sure they keep enough water for the rest of the year. This holy water is believed to be a cure for many things, from illness to bad luck. They can be sprinkled, sprayed around the house, or simply be drunk. After the bath, there are fair booths where visitors can get tea, honey, and cakes. Epiphany Day is a joyful celebration where people of all ages have nothing but fun. It’s an all day long celebration, starting from early on January 19 to late at night. To accommodate thousands of people who want to take baths, Moscow’s city official prepared dozens of pools across Moscow. They came in form of ponds and lakes and rivers with holes cut on them. There are also artificial pools, not necessarily the ones from nature. Officials are standby at each of the locations. Medics, security officials, all are ready to ensure the celebration running as smooth as possible. Number 1 person in Russia also doesn’t want to miss the opportunity to celebrate epiphany at its fullest. In 2018, Vladimir Putin took a dip at frozen Lake Seliger. The temperature was -6C, but the president took off his coat and boats and with only his swimming trunk and a cross necklace around his neck, he dipped bare-chested into the lake. The presidential spokesperson said that he’d been following the tradition for several years now, only in private. In 2018 was the first time he did the ritual in front of the public.